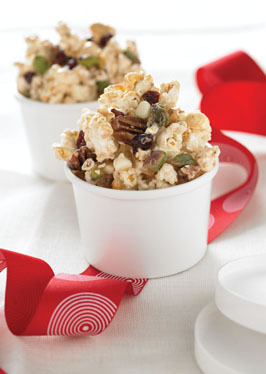 Combine popped popcorn, cranberries and nuts in large mixing bowl or pan; set aside. In 2-quart microwave safe glass measuring cup or bowl, microwave butter and marshmallows at HIGH 90 seconds; stir to mix. Microwave an additional 60 to 90 seconds at HIGH or until mixture comes to a boil; stir in cinnamon. Pour over popcorn mixture and mix well until coated. Spread evenly on lightly greased cookie sheet and bake in 250°F oven for 30 to 45 minutes or until crisp, stirring every 15 minutes. Cool. Break apart and mix in chocolate chips. Store in air-tight containers or plastic bags. * 7 to 8 cups popped popcorn.